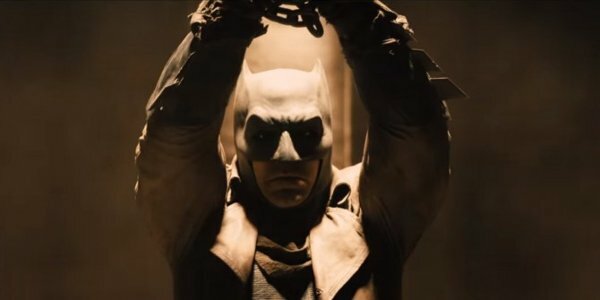 One of the more jarring sequences from Batman v Superman: Dawn of Justice was the infamous "Knightmare" sequence, where Batman tries to fight off a bunch of paramilitary goons, Darkseid and his Parademons, and of course the Man of Steel himself. Audiences have been lead to believe that this sequence is a dream, but a DC insider has come out saying that the horrific events we saw actually happened. What if what you saw was a Time Boom, a latent memory from the future when Flash comes back? If you look at the cut, he doesn’t go to sleep! He’s waiting for the [Lexcorp file decryption] and suddenly this [Knightmare sequence] comes in, and he’s jogged out of it seeing his own death. And what does he see? He sees Flash. And if you’re a DC fan, you know what’s happening. You know that Flash going back in time, that memory is now coming back to him… mind you, it’s jumbled. Right about now, you non-comic fans might be scratching your heads at some of the terminology that Jay Oliva has used in the statement above. But never fear: we're here to help decode it all. You see, in the DC Comics universe, a Time Boom is a sort of temporal wave that radiates throughout the DC Universe once a moment in time has been changed. In the case of Batman v Superman: Dawn of Justice, we see The Flash travel back in time to warn Bruce Wayne of some dark times ahead. If Jay Oliva's theory is correct, this trip or another trip like it set off a shockwave through time that somehow leads up to Darkseid's arrival and Bruce Wayne's death at the hands of Superman. While Jay Oliva admits he's not sure if Zack Snyder is completely on board with this storyline, the man did direct Justice League: The Flashpoint Paradox, so he knows a thing or two about time travel and the Scarlet Speedster. But it Batman v Superman: Dawn of Justice isn't setting up the "Flashpoint" story, what story would it be foreshadowing? Well, some fans, including our own Conner Schwerdtfeger, think that the Zack Snyder team-up is leading up to the Injustice: Gods Among Us storyline, which kind of makes sense with some of the rumors and clues we've already been exposed to. With Superman having a platoon of shock troops at his disposal, Batman being at odds with him, and Lois Lane being "the key" according to The Flash's warning, we may have just seen the beginnings of a war the likes of which we've never seen. Of course, this is provided that Zack Snyder isn't working from a completely different playbook than either of those potential Batman v Superman: Dawn of Justice follow-ups. After all, Snyder has been known to pick and choose influences and events from throughout the DC Comics Universe, only to mash them up into one big combination of influences. But while Snyder may be the only person who truly knows what he's doing, we really like Jay Oliva's theory on where things are going to. If only for the reason that the Oliva directed animated film Justice League: The Flashpoint Paradox is a hell of a triumph in storytelling. Batman v Superman: Dawn of Justice is in theaters now, while Justice League: The Flashpoint Pardox is available on Netflix Instant.